Forget all those lists of predictions for 2019. What you need is an almanack full of useful information, whether it’s when there will be full moons, the future of international affairs in a cryptic picture, or the answer to last year’s riddle. 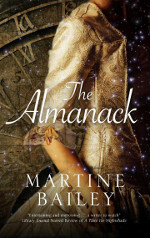 Martine Bailey, author of historical crime mystery The Almanack, spent a year living by almanack time. Her discoveries about time past will help enrich writing – and reading – of historical fiction. If the pocket watch was the must-have gadget of the Georgian era, it needed an almanack to keep it accurate. Complex charts gave advice on the mathematical calculations needed to find ‘true time’ from sundial time. Different towns had different times, giving a half-hour difference at midday between Penzance and Dover. Stagecoaches carried clocks set to gain or lose according to the sun, and Greenwich Mean Time arrived only with the railways, as late as 1880. Before 1752, an even odder discrepancy was the 11 days’ difference between Britain’s Julian calendar and the newer Gregorian system used across much of Europe. Not only had Britain’s calendar drifted out of kilter with the solar year, but Brexit-like confusion reigned over a European trading system dogged by two parallel dating systems. Thus the Calendar Act of 1752 announced the famous ‘annihilation of eleven days’ whereby Britons went to bed on Wednesday 2 September and woke up on Thursday the fourteenth. 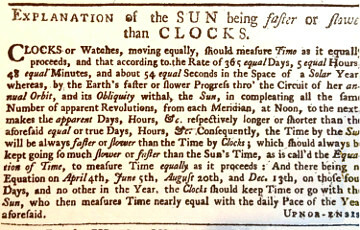 Before clock time, there was of course ‘natural time’ that follows the cycles of the sun and moon, the tides and seasons. Natural time is as slow as the speed of germinating seeds and the movement of the planets across the night sky. Almanacks were once indispensable to plan gatherings when a full moon would ease travel, for sowing crops and managing livestock. 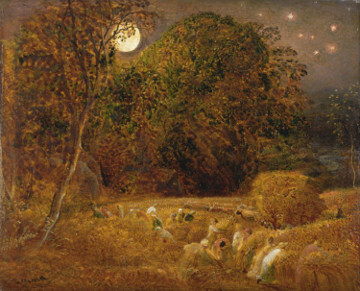 While writing from the almanack’s perspective, I first noticed the distinctions between the local hay, barley, and corn harvests, and how the harvest moon swings close to the earth like a gigantic lamp. Theories abound about what precisely eroded this close relationship with natural time but Newton’s concept of time as a steady unstoppable flow is often mentioned. Then there are industrialisation, urbanisation, the Protestant ethic – or in a single word, capitalism. One of my pleasantest research trips was becoming a ‘farmer’s wife’ at Acton Scott Museum, the home of the BBC’s Victorian Farm. The butter churning took as long as the cream needed to turn, and collecting eggs took as long as I needed to find them in the straw. 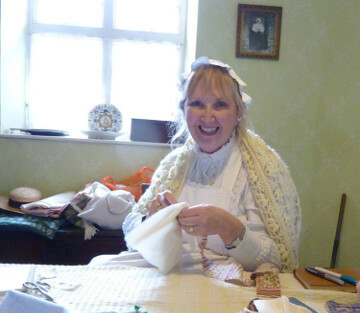 A happy band of history fans washed, cooked, tended to livestock, and when our tasks were done, we chatted and sewed around a parlour table on a wintry afternoon. A slow activity that gripped Georgian readers was ‘riddlemania’. 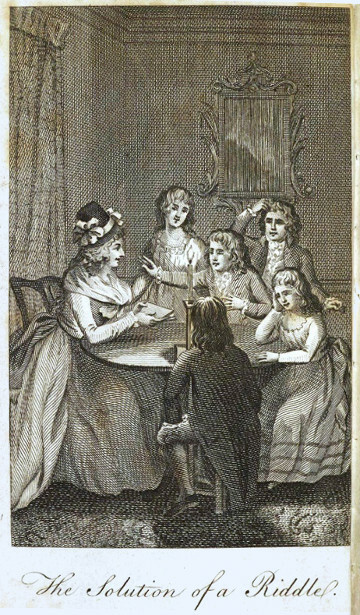 Riddling was often a communal activity, as we see in Jane Austen’s Emma, when Harriet invites contributions to a collection of “really good enigmas, charades or conundrums”. As I selected riddles to preface each of the fifty chapters of The Almanack I pitied past readers who waited a long year for the solutions to the popular riddle contests run by almanacks. Though blind, I enlighten, though free I am bound. My novel asks what might happen if an almanack appeared to predict a series of murders around the traditional year in an English village. 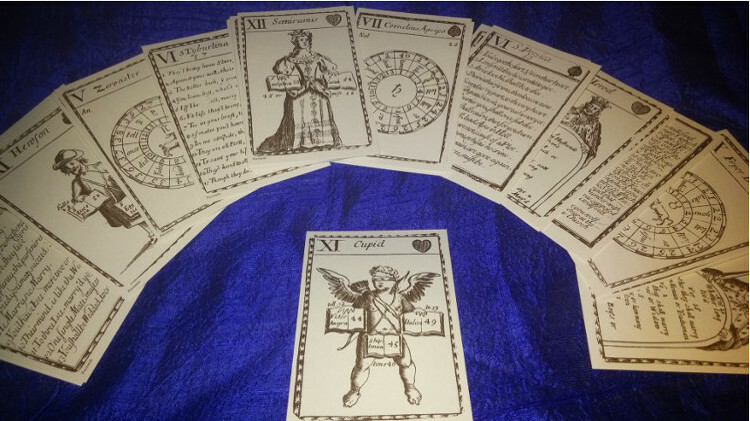 Many novelists recognise the human fascination with jumping time to glimpse the future, by means of divination, dream books, ghost stories, and aids to prognostication such as my facsimile fortune-telling cards [see main image] courtesy of Harry Margary. The most sensational almanacks sold more copies than the bible and I wondered how their prophecies would fare today. 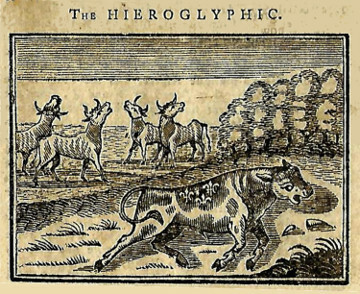 Each year, Moore’s printed its eagerly awaited Hieroglyphic, a symbolic picture suggesting ‘the state of the nations’. In my prized 1801 Vox Stellarum – an eBay bargain at just twenty pounds – the image of an injured bull bearing a fleur-de-lys is recognisably a reference to France. October’s motto reads: “Peace is sought by those who Peace invade.” I expected to scoff, but history proves that on 1 October 1801 the preliminary peace agreement between Britain and France was first published. Australian academic Maureen Perkins writes that the 18th-century movement to outlaw fortune-telling was itself sinister: “Visions of the future were a threat to the scientific might of industrial society based on the regularity of the clock.” She makes the interesting claim that denying such recreational manipulation of different futures may well be to civilisation’s cost, in a lack of wonder, imagination, and readiness for change. For a year I followed a mass of red-lettered Saints days, the lunar and solar year, the planets, high days and holidays. From gathering my apple crop on St Ninian’s day, to searching out All Hallows mummers in Chester’s pubs, I tried to commemorate the circling year. I wasn’t very good at telling the time by the Seven Stars (even with a modern app like Star chart), but I can now recognise the phases of the moon and spot the major constellations. My novel, The Almanack, became a pleasure to write, as I abandoned social media to spend evenings updating Georgian riddles and charting the night sky circa 1752. And yes, it felt like a slower and more melancholically beautiful year, especially given the recent news that Britain has lost half of its wildlife since the 1960s. Maybe more of us need to connect to the natural time of the past again – for the sake of all our futures. * Riddle answer: A book. Read Catherine Hokin’s review of The Almanack.